Scientists in China say they have developed a new way of predicting earthquakes - by observing erratic behaviour in snakes. "Of all the creatures on the Earth, snakes are perhaps the most sensitive to earthquakes," Jiang Weisong, director of the earthquake bureau in Nanning, told The China Daily. 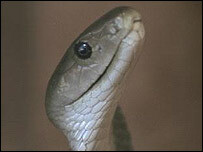 "When an earthquake is about to occur, snakes will move out of their nests, even in the cold of winter. If the earthquake is a big one, the snakes will even smash into walls while trying to escape," he told the newspaper. Nanning - an area prone to earthquakes - is one of 12 Chinese cities monitored by hi-tech equipment. It also has 143 animal monitoring units. "By installing cameras over the snake nests, we have improved our ability to forecast earthquakes. The system could be extended to other parts of the country to make our earthquake forecasts more precise," Mr Jiang said. China is frequently struck by earthquakes. In 1976, some 250,000 people died when the city of Tangshan was devastated by an earthquake.